Home > News > To (Not) Sleep, Perchance to Feel More Pain? Sleep. Everyone needs it, but not everyone gets it—at least not enough of it. Now, new animal research builds the case that a lack of sleep has significant and specific effects on pain. Researchers led by Clifford Woolf, Boston Children’s Hospital, US, and Thomas Scammell, Beth Israel Deaconess Medical Center, Harvard Medical School, US, use a novel experimental paradigm to show that acute or chronic sleep deprivation increases pain sensitivity in mice, which could be reversed by caffeine or modafinil, each of which promote wakefulness and modulate dopaminergic signaling in the brain. Interestingly, analgesics failed to improve pain in sleep-deprived animals. Together, the results bolster evidence for a sleep-pain connection and suggest a possible neurobiological mechanism underlying the link. In addition, they hint that improving sleep may not only alleviate pain, but perhaps also enhance the efficacy of pain relievers, in sleep-deprived patients. “This is a very well-done and well-controlled study using a novel model of sleep deprivation,” said Jeffrey Kennedy, an independent consultant with JK Associates BioPharma Consulting, Carmel, Indiana, US, which provides consulting services to companies working in the pain arena. “The relationship between sleep and pain is of significant scientific interest and clinical importance. I hope this paper will stimulate more research in an area that is in need of additional work,” according to Kennedy, who along with colleagues published a 2015 study showing sleep deprivation-induced pain in rats using a different experimental strategy (Wodarski et al., 2015). The current findings were published May 8 in Nature Medicine. For the new study, co-first authors Chloé Alexandre, a sleep researcher in Scammell’s lab, and Alban Latremoliere, a pain researcher in Woolf’s lab, decided to team up to study the impact of sleep on pain, considering how few of us get the sleep we need. The idea that sleep influences pain, and vice versa, is not a new one, and the presence of co-morbid pain and sleep disturbance in patients is well recognized (see PRF related news). But preclinical research in this area has been hampered by experimental sleep deprivation paradigms that overly stress study animals, complicating the interpretations of findings from previous work (e.g., see Hakki Onen et al., 2001; Tomim et al., 2016; Wang et al., 2015). For instance, in one commonly used technique, researchers will place a rat on an upside down flowerpot and then put the flowerpot in a bucket of water. When the animal falls into rapid eye movement sleep (REMS), it loses muscle tone, and so falls from the flowerpot into the water—not exactly a nice way to have to wake up. The solution they settled on was to keep mice awake by entertaining them. Each sleep deprivation would take place in the mice’s home cage where they would first receive new nesting material, and then novel objects in the form of custom-made toys that would provoke chewing (a non-stressful innate behavior), just as the animals began non-REMS (a “sleep attempt”). At any given time, there was only one toy in each cage to avoid habituation or stress. “We wanted the mice to have fun instead of going to sleep,” said Latremoliere. 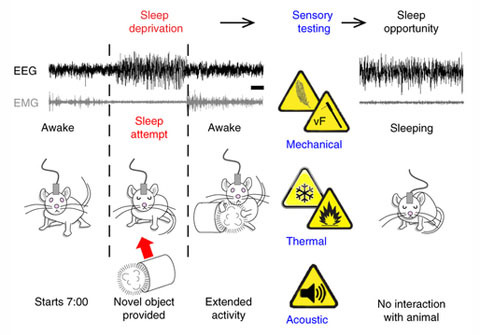 For acute sleep deprivation (ASD), the group kept the mice awake during the day for six, nine, and 12 hours, beginning at the onset of light (mice are nocturnal creatures, so most of their sleep takes place during daytime hours). For chronic sleep deprivation (CSD), the animals stayed up for the first six hours of the light period for five days in a row. To monitor sleep, the researchers made electroencephalogram (EEG) recordings from the frontoparietal cortex, along with electromyogram (EMG) recordings from the neck muscles. The approach worked: Non-REMS fell by 98 percent, and REMS by 100 percent in ASD mice, with similar reductions observed in CSD animals. Not only did the strategy deprive the animals of sleep, but it did so in a non-stressful way, with CSD animals showing no changes in plasma levels of the stress response hormone corticosterone. Sleep deprivation—even via a less stressful route—is hard upon a mouse. Both male and female ASD mice showed increased mechanical and heat sensitivity compared to baseline and to sham animals instrumented with EEG and EMG equipment but not sleep deprived; the more sleep deprivation, the greater the pain sensitivity. All of those measures improved with one day of sleep recovery. Further, intraplantar injection of the TRPV1 agonist capsaicin produced increased paw licking compared to sham mice, and the sleep-deprived animals also avoided noxious heat in an operant thermal gradient assay. CSD animals showed similar changes in pain sensitivity. Importantly, these effects occurred only upon noxious stimulation: No behavioral changes were seen with only low-intensity mechanical stimulation, nor did the animals behave differently when subjected to gentle brushing or cooling. And the increased pain sensitivity was specific to nociceptive stimuli, according to acoustic startle reflex testing that measured how much the animals jumped in response to increasing levels of background noise. “The animals jump a little bit less because they’re tired, but their responses to noxious stimuli are much higher, so sleep loss has specific effects on pain sensitivity,” Latremoliere said. Finally, the researchers tested whether “sleep fragmentation”—disrupting the continuity of sleep—could explain the changes in pain sensitivity. To test that hypothesis, they used an apparatus that produces an upward motion of the animals’ home cages every minute, without disrupting the amount of sleep. This had no impact on responses to noxious thermal or mechanical stimuli. “Even when we were sleep-fragmenting the animals for five days during the entire light period, that did not change the pain sensitivity,” Alexandre said. The investigators next administered wake-promoting agents, caffeine or modafinil, to the sleep-deprived mice. ASD animals received these drugs two hours before the end of nine hours of sleep deprivation, and CSD mice two hours before sleep deprivation ended on the fifth day. In ASD animals, caffeine or modafinil promoted wakefulness and also prevented mechanical hypersensitivity, and partially decreased heat hypersensitivity as well as avoidance of noxious heat, compared to saline-treated animals. Likewise, caffeine reduced pain sensitivity in CSD mice. Since caffeine and modafinil had no effects on heat or mechanical pain sensitivity in sham animals, or on inflammatory pain from injection of complete Freund’s adjuvant (CFA), the reductions in pain sensitivity did not appear to result from any intrinsic analgesic activity of those agents. Together, the results suggest that decreased alertness because of sleep loss accounts for the changes in pain sensitivity. Intriguingly, subcutaneous injection of the NSAID ibuprofen had no effect on sleep deprivation-induced pain. “We were surprised to see that anti-inflammatory drugs didn’t work at all to reduce the pain, because a lack of sleep has been reported to increase inflammatory activity,” Latremoliere said. Morphine, too, had little effect on pain sensitivity. What do the results mean for people with sleep deprivation and chronic pain? One thing patients should not do is rush to increase their caffeine consumption, considering that many already suffer from sleep disturbances, Alexandre said. Instead, doctors could emphasize the importance of sleep, which might improve with remedies like sleeping pills, cognitive behavioral therapy (CBT), and better sleep hygiene. Moreover, the experiments with ibuprofen and morphine suggest that improving sleep may also improve the effectiveness of analgesics. However, improving sleep as a possible non-pharmacological approach to treat pain may be challenging, considering the mixed evidence offered in CBT trials to date (Finan et al., 2014), said Patrick Finan, Johns Hopkins University, Baltimore, US. “CBT is good for sleep for those with insomnia, and for those with co-morbid chronic pain and insomnia. But the problem is that despite seeing improvement in sleep over the course of these clinical trials, we haven’t seen consistent improvements in pain that outstrip those observed in education or placebo controls, and we don’t yet know why that’s the case,” said Finan, who studies the relationship between sleep and pain in clinical populations. For patients who cannot improve their sleep with CBT, higher doses of analgesics could be warranted, or combination strategies with sleep-promoting medications at night coupled with wake-promoting strategies during the day. Different pain conditions are likely causing different sleep disturbances, and more work is needed to characterize this phenomenon. Meanwhile, clinical trials of analgesics may benefit from closer attention to study subjects’ sleep history and caffeine consumption; perhaps those trials have been unsuccessful, at least in part, because those aspects have not received their due, Latremoliere said. As for future basic science research, because the current work included only healthy animals, the researchers are doing further studies in animal models of chronic pain. One question such studies could address, Kennedy said, is whether sleep deprivation-induced pain operates via a separate pathway from other types of pain. The results also have implications for the study of other conditions such as migraine. “I certainly think this is something that migraine researchers should pay attention to,” said Greg Dussor, a migraine researcher at the University of Texas at Dallas, US. “There is a long-standing connection between sleep and migraine, with too little sleep almost always at the high end of the list of migraine triggers. It would be interesting to try to incorporate this work into a migraine context and see what we come up with,” he said. Finally, because caffeine can upregulate expression of D2 and D3 dopamine receptors, and increase binding to D2 receptors, while modafinil can inhibit the dopamine transporter, the team hypothesizes that sleep deprivation leads to increased pain through a decrease in dopamine signaling in mesolimbic circuits in the brain, which have been shown to modulate the salience of painful stimuli. The investigators are now probing the dopaminergic system to better understand the underlying neurobiological mechanisms behind their findings. In the meantime, because improving the quality of one’s sleep has no downside, it’s not too early for patients with chronic pain—or for healthy people who want to avoid it—to shut down the computer, turn off the television, put down the mobile phone, and catch some zzz’s. Decreased alertness due to sleep loss increases pain sensitivity in mice. Nat Med. 2017 Jun; 23(6):768-774. Pain and Sleep: Solve One Problem, Solve the Other? The Pronociceptive Effect of Paradoxical Sleep Deprivation in Rats: Evidence for a Role of Descending Pain Modulation Mechanisms. Short-term sleep disturbance-induced stress does not affect basal pain perception, but does delay postsurgical pain recovery. Cognitive-Behavioral Therapy for Comorbid Insomnia and Chronic Pain.